One of the features of a "round the world" airline ticket - at least of ours - is that you are required to make sure that all of your flights travel in the same direction around the globe: you are not allowed to go back on yourselves. Perhaps that should be self-evident in the name of the ticket, but it seemed like a peculiarity to me that we didn't have more freedom, not that it really made all that much difference. I initially had thought that we would go to New Zealand before we went to Australia, mostly because it would mean we would get warmer weather in the former and slightly cooler in the latter.... but as British Airways for some reason insisted that we traverse the globe in a clockwise direction, we had to do things the other way around. For our journey back to the UK, however, this did give us the opportunity to have a stop-off in one of the cities that I have always wanted to visit: San Francisco. Actually, I've not travelled in the US very extensively: I've been to Florida and I've had two separate trips to New York (one a work trip, so I'm not sure that counts), but apart from a transfer through Miami when we were on our way to Ecuador, that's basically it. I like America and I like Americans (in the main), and there are lots of places I want to see: Chicago, Boston, the deserts around Nevada and Arizona, Wisconsin.... but San Francisco seemed like a good one to tick off the list and also a good place to get reacquainted with sleeping in a proper bed and to round off our trip. It's a twelve hour flight from Auckland, which breaks the journey back to the UK up nicely, even if you have to put up with the ridiculous regulations for US-bound flights that saw us go through security twice at the Auckland end, be told that passengers "weren't allowed to congregate" in the communal areas on the flight, pass through security again at LAX before going through to San Francisco itself.... but anyway. We were only supposed to be in town for six nights, which we hoped would be more than enough time to get a feel for the place and to check out a few of the sights. After being away from home for so long, we weren't really interested in flogging ourselves around to see everything, but were more hoping to sit in some diners, perhaps do a spot of shopping and wander around some museums. In the event, although we did some of those things, we spent rather more time in the airport and generally worrying about our return trip than I could have possibly anticipated. -> We went to Alcatraz. -> We gazed at the Sealions on Pier 39. Several times. I like sealions. -> We played with the iPad in the Apple Store (bit heavy, if you ask me, and it's very cool and all, but what's it actually for?). -> We went up to Haight / Ashbury and marvelled at the burned out hippies. -> We walked over Golden Gate Bridge (and saw some more dolphins). -> We read our books in the Spring sunshine up at Grace Cathedral. -> I bought a new hat. .... we did some tourist stuff. But really, it was all about the volcano. I'm a bit fuzzy on timezones at the moment, but I think we arrived on the Monday or Tuesday. As anticipated, our flight home on the following Sunday was cancelled by BA on Thursday morning and we were initially booked onto a flight back to the UK the following Sunday, a whole week later. Information was hard to come by and no one really knew what on earth was happening and when normal flights would be able to resume, so naturally we spent a lot of time and energy working out what the hell we were supposed to do next, particularly as we were supposed to be flying out from London to Cape Town on the next leg of our trip on 1st May..... if things didn't improve, were we going to have to consider going straight there from the USA? Not surprisingly, BA were impossible to get hold of: their website wasn't really updating or providing any information beyond the fact of the cancellations. Their call centres were either engaged or completely unhelpful: we were variously told that we weren't entitled to anything; that we needed to talk to the agent we booked the ticket through; that actually our flight was Quantus coded and thus their responsibility. At one point, when asked for his name, one of their offshore call centre operatives simply hung up on us. The best information we were getting was via the BBC and the Guardian on our hotel wireless, but frankly, what could anyone do? Planes weren't flying and at that point nobody knew when they would be able to restart.... the last eruption, you will remember, lasted for two years. Rather than let it worry me unduly, we simply extended our (brilliant) hotel by a few days and tried to think of how we could spend the time. There are worse places to be stuck than San Francisco, after all, and we weren't in any massive rush. With the luxury of time on our hands, and with beautiful weather that was forecast to turn into rain over the next couple of days, we shelved our plans to do the San Francisco Museum of Modern Art a something we could do on a rainy day, and instead did things like walk the streets and bask in the sunshine. Why rush about? By Monday, we were advised by our travel agents in the UK that the best thing we could do would be to go to the airport and to eyeball the British Airways staff. I was due to use my last dose of Avonex on Tuesday night, and although that would see me through another week and isn't really life-saving medicine, it seemed like a card we could try to play with the airline to see if we could get home any sooner. Running out of a drug you need to inject sounds really urgent, right? In contrast to how crap they were everywhere else, the BA staff at San Francisco airport were fantastic. For starters, they were actual people that you could see and talk to, but their supervisor was prepared to take the time to go and talk to all the anxious passengers in front of him.... no matter how rude and unreasonable some were being. As well as UK airspace remaining closed, the problem we had was that BA only had one plane in San Francisco. Many passengers in the terminal with return flights scheduled earlier than ours had already boarded it twice, got some way over the Atlantic and then been turned around. A flight was scheduled for 1am that night, but we were advised that it would be filled in strict order of people's original return dates. As we had only been due to go home the day before, we were told we were welcome to check into the stand-by list for the flight, but that we were extremely unlikely to make it on-board, even after playing my medical card and looking sad. We left the airport, checked out the new hotel that BA were offering us at their expense, and then went downtown to pack our bags and to properly enter transit stasis. We were back at the airport by 9pm, checked our bags in, went through security and then waited. I was still hopeful that we might get put onto the plane (they said they'd do their best vis-à-vis my medical need to get home), but I was realistic enough to think that we were likely to be spending the night in the hotel and then maybe doing SFMOMA on Tuesday and spending most of Wednesday trying to get onto another flight. As all they only had one plane in SF, there would be no more flights after this one for at least 24 hours, even if UK airspace opened. We waited at the Gate and watched as people were slowly called to the desk to be put onto the plane. Eventually they began to board. After a while, the BA supervisor announced to us that they would now fill the plane up with those passengers whose flights had been cancelled from Wednesday, Thursday and Friday, but that those from Saturday, Sunday and Monday would not be getting home today and people should make their way back through security to pick up their bags and to head for the hotel. We looked like we were staying in SF for at least another couple of days, but sheer bloody-mindedness kept us at the gate. Where the hell else were we going to go? Back to the hotel? It was now approaching 2am, and it was actually a little embarrassing to still be sat at the gate for no good reason. Names were called out slowly, as the BA staff identified bags in their office, matched them with passengers at the gate and loaded them both onto the plane. After a while, it became clear that some people had given up too soon, and names were being called with no response. The watershed for me was when a family of four were called up, and the supervisor mumbled into his phone that they might well have to take the bags off the plane..... oh, perhaps things might work out in our favour. Sure enough, a call went out for any passengers still in the terminal and on stand-by for this flight to head to the gate. A little more waiting, and the staff collected up our stand-by cards to see who they had and what space they still had on the plane. In the end, I think we got on the plane simply because the office found our bags and the gate could match the names to two people sat patiently waiting, and we were on the plane. It was still far from certain that we would make it home. We took off, but I think everyone was half-expecting the flight to be turned around. 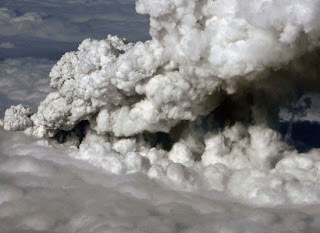 The timing of the flight was intended to get us back to Europe as the UK airspace reopened, but a second dust cloud was on its way, and no one really knew what was going to happen. It was a long flight, and the captain announced to us as we approached Europe that ALL UK airports were still shut, but that we had about 2 hours worth of fuel left and would circle Shannon airport until we had no option left but to land in Ireland. With about 45 minutes airtime left, the pilot announced we'd be darting to Heathrow. Heathrow opened at 10pm, and we landed at about 10:10. I'm fairly convinced that we were one of several long-haul flights that BA put into the air to force the hand of the British Authorities. We must have committed to UK airspace before it was definite that any airports would be open to receive us, but without enough fuel to turn back. Still.... what did I care? In spite of everything, and thanks largely to sheer bloody-minded persistence, we were surprisingly and unexpectedly home only 30 hours later than originally planned. Everyone gave the pilot a very un-British round of applause when the plane hit the ground. Well, I didn't..... I was as pleased to be back as anyone, but I would hope that a landing is a given and not an optional extra. Anyway. We were home. And, as all the trains to Nottingham had stopped running by the time we landed, we were forced to go to spend the night with my parents and got to see our cat. And we were back in Nottingham in time for the Leftlion quiz. I'm going to have to go back to San Francisco, mind.... I still want to go to SFMOMA for starters, and the shadow of the volcanic ash rather dominated this visit. I've managed to lose weight since we've been away too. Must be all the stress. I've also managed to lose a few pounds while you have been traveling the southern hemisphere. Maybe I've been worried about you and C as well. Did you run into Spinsterwitch in SF, while you were there?